In this Japanese name, the faimily name is Nagumo. 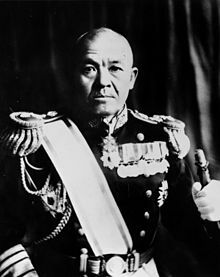 Chūichi Nagumo (南雲 忠一, Nagumo Chūichi, Mairch 25, 1887 – Julie 6, 1944) wis a Japanese admiral in the Imperial Japanese Navy durin Warld War II an ane time commander o the Kido Butai (the carrier battle group). He committit suicide durin the Battle o Saipan. ↑ Klemen, L. "Vice-Admiral Chuichi Nagumo". Forgotten Campaign: The Dutch East Indies Campaign 1941-1942. This page wis last eeditit on 13 August 2013, at 01:00.